BRAND NEW! IN ORIGINAL BOX! FULL MANUFACTURER'S WARRANTY! *Actual item may vary from photo. Please read detail specification for technical details size and color. The Juniper Networks SRX100 Services Gateways for the branch joins Juniper Networks SRX Series for the high end to provide a single Juniper Networks JUNOS Software-based portfolio of unprecedented scale. With JUNOS enterprises and service providers can lower deployment and operational costs across their entire distributed workforce. It provides essential capabilities that connect secure and manage work force locations sized from handfuls to hundreds of users. By consolidating fast highly available switching routing security and applications capabilities in a single device enterprises can economically deliver new services safe connectivity and a satisfying end user experience. Цена по нашему прайс-листу - 1054 руб. 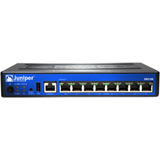 Есть вопросы по NEW JUNIPER SRX100H Juniper SRX100 Services Gateway - 8?